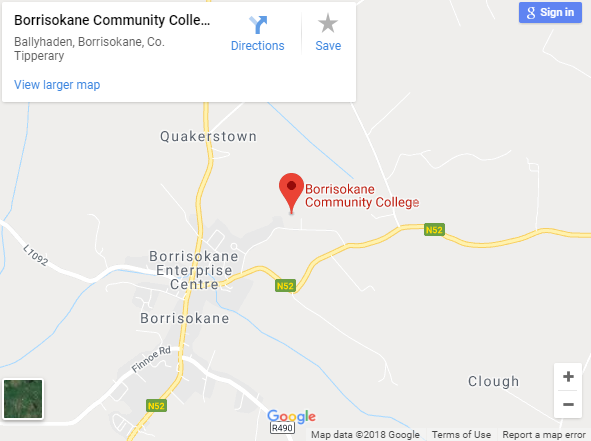 Borrisokane Community College School Notes April 6th 2019. The first and second year girls camogie team played in the Tipperary ETB 1st & 2nd year 7 aside camogie blitz in Roscrea on Thursday 4th of April Borrisokane had two teams in the competition. Borrisokane Team 1 played St. Ailbe s first and despite a slow start found their stride and came out as worthy winners. They played Roscrea 2 in their second game, this was a tougher game but again the girls finished strong and came out as deserved winners. They now faced favourites Nenagh College in the cup semi final. Despite horrendous weather conditions the girls played out of their skin and had a shock win to enter the final against Roscrea 1. This was a high standard game with both teams giving it their all. Roscrea settled better and were up 2 goals to none at half time. Despite this, Borrisokane continued to fight and came right back into it fighting to the bitter end. Final score Roscrea 4-0 Borrisokane 2-0. The Borris girls displayed great camogie all day, well done to all. 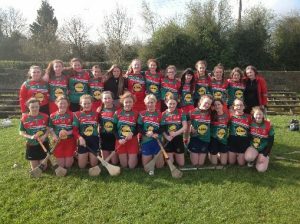 Borrisokane Community College first and second year Camogie teams who competed in the Tipperary ETB Camogie Blitz recently. It was an early start for 11 of our 2nd year students as they headed to Croke Park for the Worldwise Global Schools national conference on Thursday April 4th. In attendance was representatives from our Global Citizenship Education Committee and our Green Schools Committee across all four second year groups. We committed to acting on one Sustainable Development Goal per class through CSPE this year in our school. Students and teachers are to be commended on their ideas and enthusiasm from the outset. The wider school community has been very open and supportive towards our efforts which included: Reducing plastic by introducing bamboo cutlery, Aluminium school water bottles, Becoming a certified Fairtrade school, Highlighting and reducing gender inequality through a mixed gender soccer match, Raising awareness of climate change, Visiting Cloughjordan Ecovillage, Starting a compost heap and school garden, Helping those going hungry in our community with Nenagh Food Bank and Forging links with Unicef. Everyone’s efforts were recognised at the Conference in Croke Park and Borrisokane Community College received the Diplomatic Passport Award. On Thursday March 21st, Borrisokane Community College had the pleasure of hosting the first Tipperary E.T.B. Public Speaking Competition. Students from Tipperary E.T.B. schools were invited to speak on topics of relevance to their lives, such as school, sport, what it means to be Irish and teenage life. Students represented their schools in First Year, Junior and Senior categories with coherent and skilfully delivered speeches. As Public Speaking is such an important life skill, it was great to see the students express their thoughts so articulately. Students and teachers were complimented on their achievement by adjudicators Michael Egan and John Holmes. First Year: 1st place – Neil Gallagher, Coláiste Dun Iascaigh, Cahir. Runner Up: Dylan Casey, St. Ailbe’s, Tipperary. Junior: 1st – Amy Dunne – Borrisokane Community College. Runner Up: Tia Casey Simpson, Coláiste Dun Iascaigh, Cahir. Senior: 1st: Seán Mac Curtáin, Gaelcholáiste Chéitinn, Clonmel. Runner Up: Nadia Fletcher, Coláiste Phobal, Roscrea. Bhí lá iontach againn ar Déardaoin an 21 Márta le Comórtas Óráidaíochta anseo i mBuiríos Uí Chéin. Ghlac daltaí ó Choláiste Phobal Ros Cré, Gaelcholáiste Chéitinn Cluain Meala, Coláiste Dún Iascaigh, Coláiste an Aonaigh agus ar ndóigh ghlac scoláirí ón ár scoil páirt ann. Bhí orthu óráid a ullmhú a lean thart ar 3 nóiméad agus phléigh siad go leor topaicí a bhaineann leo. An Scoil, Caitheamh Aimsire, Cairdeas, An Fón Póca, Spórt sa lá atá inniu againn agus Fadhbanna ár Linne. Ba iontach an rud é daltaí spreagúil a chloisteáil ag plé cursaí mar seo, go muiníneach agus bhain gach duine an-tairbhe as an lá. Ba mhaith linn ár mbuíochas a ghabháil chuig na moltóirí Jerry Cronin agus Pádraig Ó Neachtáin, an Chathaoirleach Iníon Nic Giollarnáth agus Laura Hayes ar an gclog. Is beatha teanga í a labhairt agus bhí an Ghaeilge beo gan dabht an lá sin. Mhol na moltóirí gach dalta go hard na spéire. Na buaiteoirí: An Chéad Bhliain; An chéad áit Naoise Fuireastal, Cluain Meala, ardmholadh chuig Sarah O Toole, Ros Cré. Sóisir; An chéad áit Ella Heeran, Coláiste Dún Iascaigh agus ardmholadh chuig Ben O Gallachóir, Cluain Meala. Sinsear; An chéad áit Eve du Berry Ros Cré agus ardmholadh chuig Chloe Hayes, Buiríos Uí Chéin. 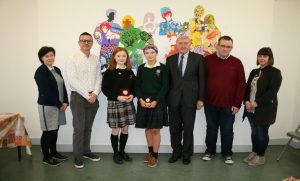 Borrisokane Community College hosted an English Public Speaking competition recently. Students here received awards. 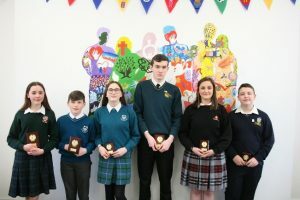 Borrisokane Community College hosted a Gaeilge Public Speaking competition recently. Students here received awards.